The Frontier Fields work continues to probe the deep field data obtained by the Hubble Space Telescope. In the future, the researchers will use the James Webb Space Telescope data as well. The focus is on the immense gravity wells of massive galaxy clusters. The article How Hubble "Sees" Gravity gives a good overview of what the analyses being done. And how the work creates a back-and-forth relationship: gravitational lenses help astronomers map the matter of clusters while the refined map of the matter helps astronomers predict locations of distant galaxies. That the hidden dark matter is not uniform or evenly distributed causes the elongated arcs and streaks, the repeated images, and the brightening of remote galaxies. The dark matter is "significantly lumpy." 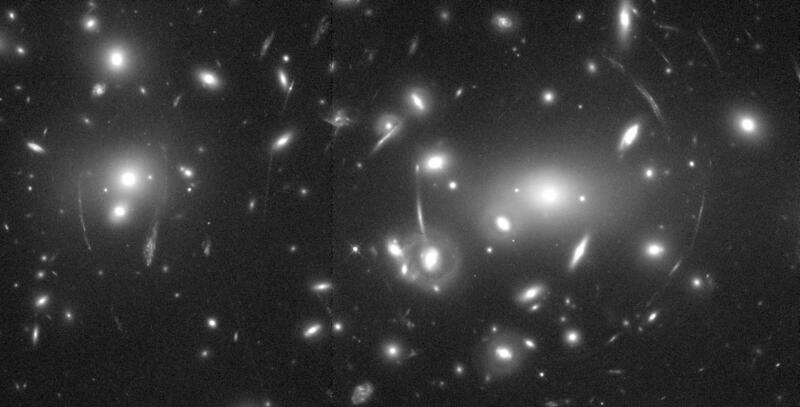 Abell 2218 galaxy cluster image from the Hubble Site.